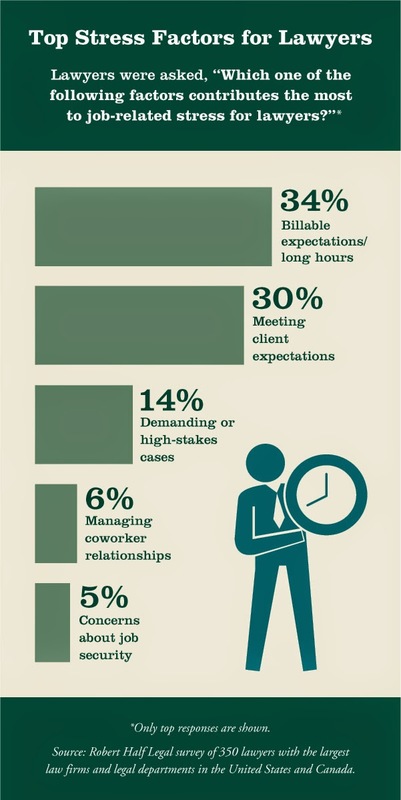 The findings and the image itself are from the Robert Haft Blog post, Billable Hours Pressure Tops List of Stress Factors in Legal Profession. When Jack joined the firm, the firm's billing practice was said to consist of several factors that included: the outcome of the case, the value of the case, the complexity of the legal issues, the number of key partners and of attorneys and support staff committed to the case. All of these factors were said to have to be evaluated before a final bill was fixed. The amount charged to the client was virtually always reached after consultations with the client so that the client's expectations were reasonably related to the charge finally made. While the advent of the billable hour, facilitated greatly by the introduction of the computer to the firm's operation, provided certain benefits to the firm's billing practice, it not only facilitated the quantification of attorney hours invested in the case, it created a new approach to determining the compensation of the firm's associates and the facilitation of determining whether the associate should be retained, dismissed or advanced. Jack was reasonably certain that these were not the only factors taken into consideration in assessing the value of the associate to the firm, but it was a fairly simple and reasonable way to come to decisions on associates that weren't clearly visible by the partners working on cases in which the associate was assigned. It was also an important factor in determining the profitability of the firm year-to-year that the firm considered attainable. As might be expected, this led inexorably to an increase in the target hours that were expected from associates before they were eligible for a bonus at the end of the year. Inevitably, the target rose to 1900 hours and higher with bonus levels ranging from 2000 to 2400 per year. In addition, the associate was expected to include his or her pro bono hours, continuing education hours, and his new business-getting efforts. Although Jack was totally sympathetic to the near impossible task assigned to the associates, especially those who had families and were involved in bar associations developing valuable contacts and identity in the bar, he was very disappointed to observe clear instances of associates padding their hours on some rationale that Jack did not want to find himself discussing with them. -from Gutierrez, Jr., Max, "The Life and Death of John J. Stevens, Esq. as a member of the Legal Profession," in ACTEC Law Journal, Spring 2013/Fall 2013, at 202, 203.